OLD PARKED CARS. 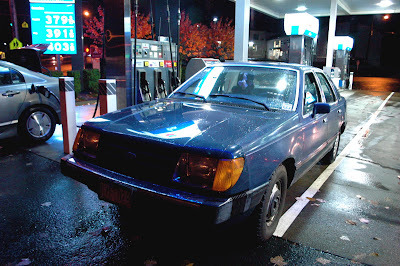 : Saturday Night At the Pump: 1984 Ford Tempo GL. Saturday Night At the Pump: 1984 Ford Tempo GL. Rare as hell, great find! Digging the side profile shot with the missing hubcap. yeah, y'know, i had it pegged as an '84, but the owner told me it was an '89. that surprised me, but i didn't research it before posting. sure enough, the '89s looked nothing like that. been hunting one of these for a long time, and i'm a little disappointed that mao found one first, but at least it was a different car. also disapointed that you can't make out the non-flush headlights, which are my the most remarkable thing about this car to me. still need a first-gen taurus. 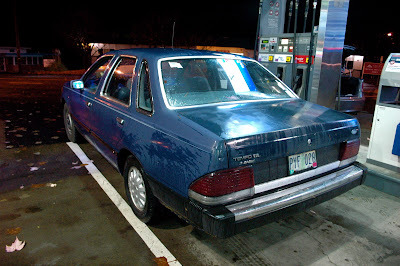 Yep, these had the flush headlights by '86, this is either an '84 or '85. Nice catch, haven't seen one of these in years. Used to own an 86 myself (same as the 86 with flush headlights). 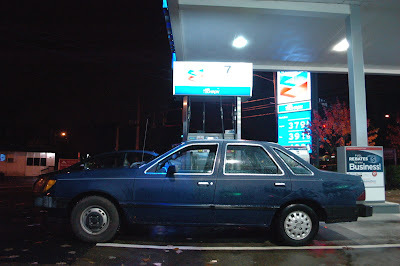 it was the last year they had carburated engines - my best friend had an identical 87 with fuel injection.